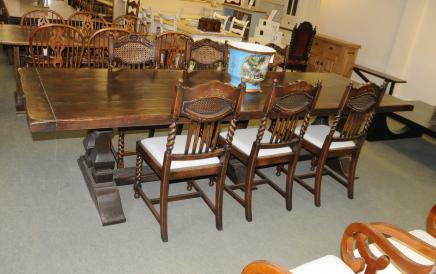 You are viewing a wonderful set of 8 English William and Mary style dining or kitchen chairs in oak. The chairs have very distinctive hand carved features, including of coures the superb barley twist legs. For those of you looking for that cosy rustic farmhouse look then these really are the Holy Grail. The set consists of two arm chairs and six sides. We bought them from a dealer in Sandringham and will ship to anywhere in the world. We have pictured them around a refectory table we have so let us know if you are looking for a table and chair set. Canonbury Antiques would like to mark the sad passing of Margaret Thatcher, Britain’s first female Prime Minister. Thatcher’s constituency was Finchley in North London, close to where our showroom is currently located. Indeed Martin Worster, MD of Canonbury Antiques, was lucky enough to meet the Iron Lady on numerous occassions throughout the 80s and 90s via his work with the Conservative Party. We’ve included a number of photos of Martin Worster at an Antiques Roadshow event in North London with Lady Thatcher. We date the photos to the early 90s. Mrs Thatcher looks delighted as Martin shares his expert knowledge on antiques that local inhabitants had brought in to be evaluated. The event was a major success. Looking at the photos you can see one where the factory stamp on a porcelain plate is being identified, another shows a bronze cherub statue being dated and in the last photo Martin is describing a trinket box. Thatcher’s expression in this photo is priceless. Thatcher was Britain’s longest-serving Prime Minister of the 20th Century and a lady of formidable intellect, drive and talent. Rest In Peace Maggie.